This fantastic Autobin bin kitchen bin sale combo twin set makes a great house warming kitchen accessories gift. The 50L 'Oval' kitchen and 8L bedroom or bathroom sensor bin will add a new dimension of hygiene in any home. 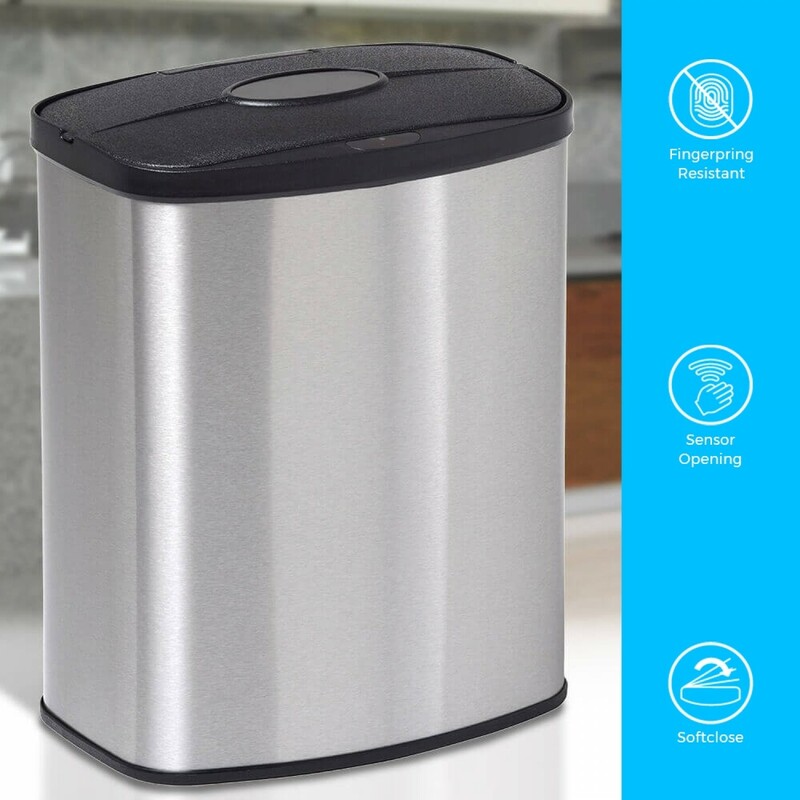 The Kitchen Bin Sale 50L/8L 'Oval' motion activated sensor bin eliminates the need to touch - Patented infrared motion sensors to open and close automatically. 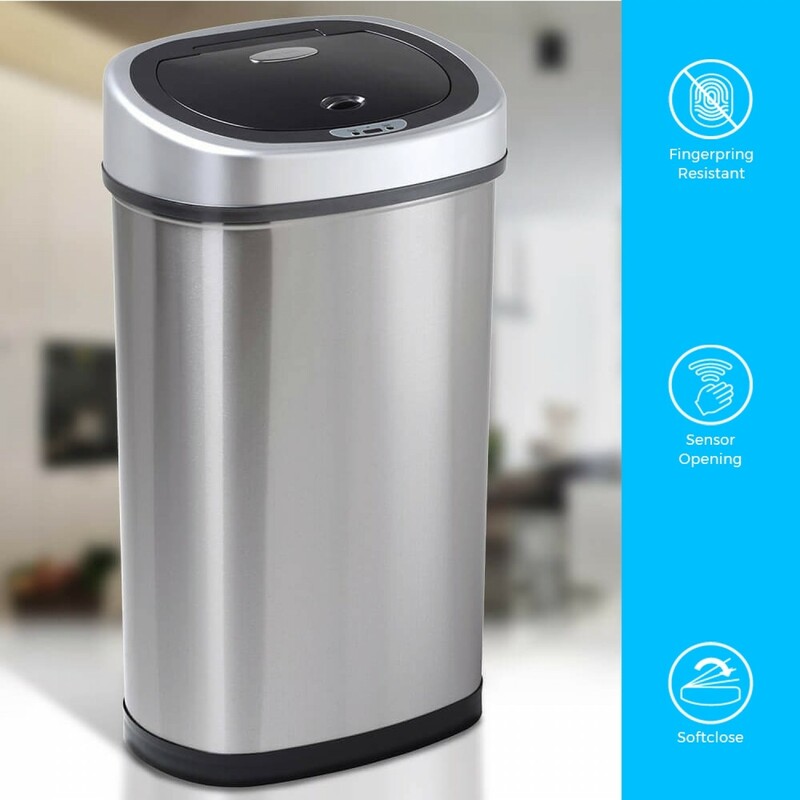 The elegant body is made from brushed stainless steel with smooth tapered lines which ensures bin liners never get stuck. This extra value combo kitchen bin sale pack gives you two of our best kitchen accessories in one neat package. 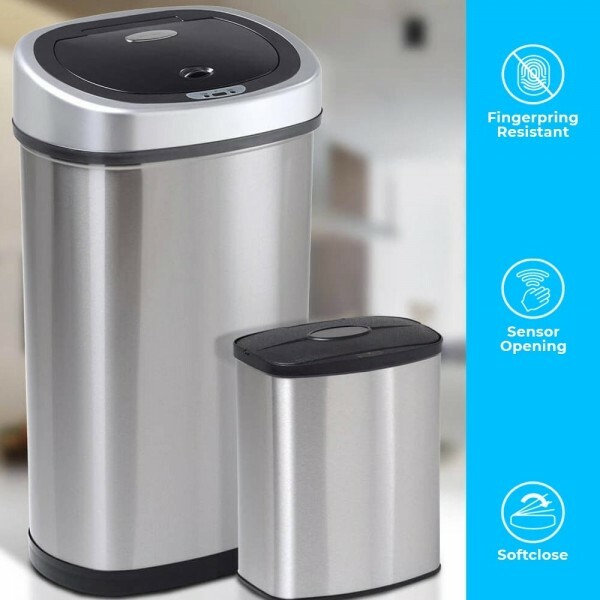 This kitchen bin sale combo gives you lots of options when it comes to managing the household waste at home or dealing with waste in a professional setting. Some of our customers use them in one room for different types of waste as they co-ordinate well, while others use them in different parts of the home. They are popular in offices or in workplaces with a reception area as they look good and offer a modern and hygienic solution to the everyday problem of waste. Both the larger 50 litre and the smaller 8 litre options included in the combo are equipped with the smart sensors that we use across our wide range of auto bins which means they make use of the very latest in infra-red technology to open when they detect the movement of your hand. Unless you press a button to keep them open, they then close by themselves after 3 seconds, giving you ample time to deposit the waste in the bin. This means that the bins can be operated without the need to physically touch them – preventing cross contamination and keeping both the hands of the user and the bins themselves cleaner. This makes them ideal for use in high pressure environments where hygiene is essential. It also gives you reassurance when the bin is to be used by a child or a less able adult. Hygiene is so important, and the auto bins have been designed with hygiene in mind the whole way through the process of development; from the initial idea, right through to manufacture. Both bins also come with one of our most innovative designs – the bag retaining ring. This is a clever loop that fits inside the bin to hold the bin lining bag ion place. So, it doesn’t slip, it doesn’t slide and it doesn’t sag. This means fewer spills inside the bin and no more holding the bag taut to get the waste into the bin – the bag retaining ring also lets you tuck the unsightly top of the bin bag neatly away. So, your new bins work well and look great too! We only use premium grade stainless steel in all of our kitchen accessories – each is created to be durable, robust and reliable. We go through a stringent testing process with all our products and are constantly developing our designs to meet your needs. This combination pack allows you to completely change the way you dispose of waste in your home or workplace, making it more hygienic, more user-friendly and more stylish. The aesthetics of our products are an important aspect of what we do – both these bins have the same brushed stainless steel finish that looks great and wears well, resisting fingerprints and remaining easy to clean. Whether you use the bins at home or in the catering, medical or other professional trade, you can rest assured that the quality is top notch. Our 10-year warranty underpins all our kitchen accessories is an opportunity to get two of our highly acclaimed auto sensor bins at a great value price. The 50L bin can use any bin bag! The 8L has the inner bucket.